Caution - The operator of the FuelStik "Master" is solely responsible to assure that the correct scale is properly installed in the Float Tube and that through on-ground experience the operator has observed that the quantities shown are accurate. The FuelStik is a secondary means of estimating fuel quantity and in no way is meant to replace the fuel measuring equipment mandated by FAR's or otherwise. • Available “Aircraft Specific Scales” Can be downloaded and printed from the website. • Can easily be calibrated to any tank using the “Universal” scale. A worksheet, written instructions and even an instructional video are available at the website. 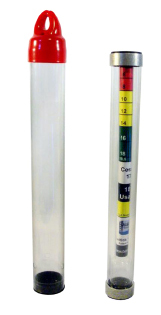 • It’s shipping tube doubles as a “Vented Storage Tube”. This allows any remaining fuel to evaporate between uses, provides a protection for the life of the unit and reduces manufacturing waste. • It’s design gives consistent readings even when the fuel in the tank is sloshing around. • Quantities given in both Gallons and Pounds!